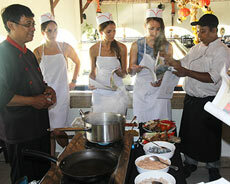 Cooking Class: Be a Balinese Chef in 3 hours! Discover the secrets of Balinese and Indonesian food at Pencar Seafood & Grill's Cooking Class. An easy, fun and educational sessions for you or family or groups, expertly guided by our native Balinese chef who will help you to learn the culture, the ingredients, and how to prepare and create an authentic Balinese and some popular Indonesian dishes. Certificate of completion is included. Class will be take place at Pencar Seafood & Grill in Seminyak. For large group, it will be take place at Villa Seminyak Estate & Spa. 30% off in April only! Minimum 2 people bookings at Rp 520k ++ Rp 364k ++per person. One person booking will be at Rp 650.000 ++ per person. The class is about 3 hours including lunch at the end of session. Welcome drink, Oshibori towel, recipe booklet, cooking class certificate, souvenir, free return transfer within Seminyak area. Minimum 5 people booking at Rp 650k ++ Rp 455k ++per person. For 2 - 4 people booking is at Rp 702.500 ++ per person. One person booking will be at Rp 826.500 ++ per person. The class is about 5 hours including tour to traditional market and experience the search and bargain for all the ingredients. Traditional market tour, welcome drink, Oshibori towel, recipe booklet, cooking class certificate, souvenir, free return transfer within Seminyak area. NOTE:To ensure you will have a well-prepared cooking session with us, book in advance maximum one day before cooking class with the latest confirmation at 1 PM (local time) is recommended. Note: This class is not including accommodation, to book your stay please check the rates and availability through reservation box on the right. 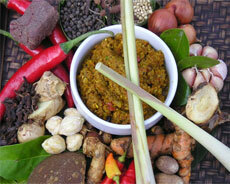 Learn how herbs and spices are essential in Indonesian and Balinese cooking. Here, you will learn the techniques and become familiar with the natural herbs, spices, and other ingredients that make Balinese food delightfully tasty as well as nutritious and cleansing. Indonesia was known for its spices from decades ago especially the Maluku island that historically known as the "Spice Islands" by the Chinese and Europeans. Spices are available plenty throughout Indonesia which are used in food and become indispensable component in daily cooking. Bali is no exception. Commonly, Balinese mixes up spices to get rich flavor which makes food tastes spicier than some food from nearby Java island which notably known to be generally sweet taste. Our chef will introduce you in deep about basic ingredients such as spices that will be used to make the food. Each spice has its own characteristic that on certain condition used solely in food making and essential to another. Kaffir Lime, where the leaves and the fruit are both used, has a strong lime flavor. Lemon Grass, a short, thin grass with a distinct lemon flavor is usually found in Balinese cooking. Also Balinese use a lot of onions. The onion is similar to a shallot but stronger and smaller. They are peeled and finely sliced or pounded with other ingredients. These are example of general ingredients that used in Balinese and Indonesian cooking which easy to find at the local traditional market. Nowadays, some of it also can be easily found at the supermarket as well. Bali cooking is a creative process that is relatively complex but lot of fun. Through demonstration and hands-on experience, we will prepare and teach you how to make these foods on an assortment of exquisite dishes, from main course to dessert or snack. When we talk about Balinese food we can’t get away from the discussion of lawar. Lawar is Balinese traditional food, well-known in all over Bali and available in many Balinese restaurants. Lawar is mixed vegetable with chopped meat, vegetable, spices, and coconut which taste is sharpened with natural flavors. Lawar is usually served with rice and other dishes, where Babi Guling or suckling pig is also present to be one of the famous dishes in Bali. On Babi Guling, the pig is stuffed and infused with a spicy concoction typically involving turmeric, coriander seeds, lemongrass, black pepper and garlic, and traditionally spit-roasted. Lawar and babi guling are two most made cooking during Balinese religious or social ceremony. Onother popular dish that we will practice during the cooking class is Sate Lilit. This is a variation of satay, traditional Indonesian meat skewers where minced or ground meat is blended with bumbu (seasoning) and other spices. The making of sate lilit needs a special skill due to the required process it needs. We will demonstrate and teach you how to make a good and proper sate lilit. Mainly, how the minced meat mixture is lumped and twisted around a wooden skewer or lemongrass stalk, and grilled to finally ready to be served. Beside food, we will also practice how to make a basic spice paste where it is used regularly to give the best Balinese dishes a distinct flavor and kick. It is called as sambal, a chili-based sauce, or basa genep (literally means 'complete seasoning'), which known for its richness in taste. You will also learn to make a popular and classic Indonesian dish called nasi goreng, a fried rice with vegetables and meat/seafood combination such as (chicken, beef, shrimps, a fried egg or any meat you like). To ad taste, usually it added with condiments such as cucumber and chili pickles and fried dried onions. Another common dish, which you can find easily everywhere in Indonesia is fried noodles, as it familiarly called mie goreng, a favorite for many. We will teach you how to create these simple menu. While an appetizer is uncommon, snack is very popular after meal or break time. On the last session, you will make a simple most popular snack or dessert in the country. Snacks in Bali are usually made to accompany during break time with coffee. Among many examples is Banana Fritters —called as Godoh in Bali and Pisang Goreng in Indonesian. Pisang goreng was known as simply deep fried battered banana that its popularity spreads across Indonesia where you can find it easily at any traditional markets and stalls in the street side. Today, though, pisang goreng has appeared on restaurants with lot of garnish to be added to accompany its serving such as palm sugar, chocolate, cheese, jam, even with ice cream and has became one of pastry point item. » Enroll your Balinese Cooking Class now!